This article is about the H. G. Wells novel. For the eponymous character, see Griffin (The Invisible Man). For the Ralph Ellison novel, see Invisible Man. For other uses, see The Invisible Man (disambiguation). While its predecessors, The Time Machine and The Island of Doctor Moreau, were written using first-person narrators, Wells adopts a third-person objective point of view in The Invisible Man. A mysterious man, Griffin, arrives at the local inn owned by Mr. and Mrs. Hall of the English village of Iping, West Sussex, during a snowstorm. The stranger wears a long-sleeved, thick coat and gloves; his face is hidden entirely by bandages except for a fake pink nose; and he wears a wide-brimmed hat. He is excessively reclusive, irascible, unfriendly and an introvert. He demands to be left alone and spends most of his time in his rooms working with a set of chemicals and laboratory apparatus, only venturing out at night. While Griffin is staying at the inn, hundreds of strange glass bottles (that he calls his luggage) arrive. Many local townspeople believe this to be very strange. He becomes the talk of the village with many theorizing as to his origins. Meanwhile, a mysterious burglary occurs in the village. Griffin is running out of money and is trying to find a way to pay for his board and lodging. When his landlady demands that he pay his bill and quit the premises, he reveals part of his invisibility to her in a fit of pique. An attempt to apprehend the stranger is frustrated when he undresses to take advantage of his invisibility, fights off his would-be captors, and flees to the downs. Griffin's furious attempt to avenge his betrayal leads to him being shot. He takes shelter in a nearby house that turns out to belong to Dr. Kemp, a former acquaintance from medical school. To Kemp, he reveals his true identity. Griffin is a former medical student who left medicine to devote himself to optics. He recounts how he invented chemicals capable of rendering bodies invisible, and, on impulse, performed the procedure on himself. Griffin tells Kemp the story of how he became invisible. He explains how he tried the invisibility on a cat, then himself. Griffin burned down the boarding house he was staying in, along with all the equipment he had used to turn invisible, to cover his tracks; but he soon realised that he was ill-equipped to survive in the open. He attempted to steal food and clothes from a large department store, and eventually stole some clothing from a theatrical supply shop and headed to Iping to attempt to reverse the invisibility. Having been driven somewhat unhinged by the procedure and his experiences, he now imagines that he can make Kemp his secret confederate, describing a plan to begin a "Reign of Terror" by using his invisibility to terrorise the nation. Griffin shoots a constable who comes to Kemp's aid, then breaks into Kemp's house. Kemp bolts for the town, where the local citizenry come to his aid. Griffin is cornered, seized and savagely beaten by the enraged mob, with his last words being a desperate cry for mercy. Despite Griffins murderous actions, Kemp urges the mob to stand away and tries to save the life of his assailant, though it is not to be. The Invisible Man's naked, battered body gradually becomes visible as he dies, pitiable in the stillness of death. A local policeman shouts to have someone cover Griffin's face with a sheet. In the epilogue, it is revealed that Marvel has secretly kept Griffin's notes and has now become a successful business owner, running the "Invisible Man Inn". Since Griffin's notes are coded, Marvel is completely incapable of understanding them. However, when not at work running his inn, Marvel sits in his office trying to decipher the notes in the attempts of one day recreating Griffin's work. Children's literature was a prominent genre in the 1890s. According to John Sutherland, Wells and his contemporaries such as Arthur Conan Doyle, Robert Louis Stevenson and Rudyard Kipling "essentially wrote boy's books for grown-ups." Sutherland identifies The Invisible Man as one such book. 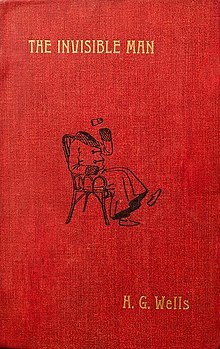 Wells said that his inspiration for the novella was "The Perils of Invisibility," one of the Bab Ballads by W. S. Gilbert, which includes the couplet "Old Peter vanished like a shot/but then - his suit of clothes did not." Another influence on The Invisible Man was Plato's Republic, a book which had a significant effect on Wells when he read it as an adolescent. In the second book of the Republic, Glaucon recounts the legend of the Ring of Gyges, which posits that, if a man were made invisible and could act with impunity, he would "go about among men with the powers of a god." Wells wrote the original version of the tale between March and June 1896. This version was a 25,000 word short story titled "The Man at the Coach and Horses" which Wells was dissatisfied with, so he extended it. Russian writer Yakov I. Perelman pointed out in Physics Can Be Fun (1913) that from a scientific point of view, a man made invisible by Griffin's method should have been blind, since a human eye works by absorbing incoming light, not letting it through completely. Wells seems to show some awareness of this problem in Chapter 20, where the eyes of an otherwise invisible cat retain visible retinas. Nonetheless, this would be insufficient, since the retina would be flooded with light (from all directions) that ordinarily is blocked by the opaque sclera of the eyeball. Also, any image would be badly blurred if the eye had an invisible cornea and lens. The Invisible Man has been adapted to, and referenced in, film, television, and comics. ^ The Science of Fiction and the Fiction of Science: Collected Essays on SF Storytelling and the Gnostic Imagination. McFarland. 2009. pp. 41, 42. ^ Wells 1996, p. xv. ^ Wells 1996, p. xviii. ^ Wells 2017, p. xvii. ^ Wells 1996, p. xxix. Wikimedia Commons has media related to The Invisible Man.